Hello friends, hope you all are fine and enjoying good health. 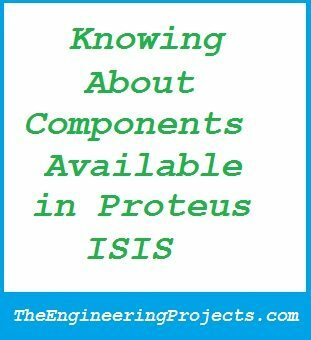 In this tutorial, my actual plan was to cover the mostly used components in Proteus like to give users an overview of component selection as there are many components in Proteus which are quite hidden and hence quite difficult to find. But, now I have changed my mind as I have received a lot of emails regarding this tutorial in which mostly have asked to elaborate this tutorial and explain other circuits as well just like the LCD one. So after that I thought of making separate tutorial for many different circuits. These are the parts in which I have divided this tutorial and as you can see I have added the news topics as well which are requested by the readers. If you guys need any tutorial then let me know via Contact Form, and I will try to post that as well. How To Use Virtual Terminal in Proteus ISIS. In this tutorial, I will design a simple serial port circuit and then get the data on the Virtual Terminal. Virtual Terminal is quite same as the Hyper Terminal in the windows XP. It shows the data coming from serial port and also sends the data to the serial port. How To use Oscilloscope in Proteus ISIS. Oscilloscope is great functionality in Proteus and it works as same as the oscilloscope you have seen in your electronics lab. It shows waveforms and using it you can make variations in your model and can get the desired output. DC Motor Drive Circuit in Proteus ISIS. In this tutorial, we will check the DC Motor circuit with microcontroller and will drive it. Stepper Motor Circuit in Proteus ISIS. In this tutorial, we will check the Stepper Motor circuit with microcontroller and will drive it. Servo Motor Circuit Design in Proteus ISIS. In this tutorial, we will check the Servo Motor circuit with microcontroller and will drive it. How to use Serial Registers in Proteus ISIS. In this tutorial, we will use serial registers with microcontroller. Microcontrollers have limited I/O pins but what if you need 50 pins, which happens mostly in LEDs, then there’s a need to increase the pins of microcontroller and for that purpose we use serial registers. That’s what I have planned so far, I may add few more tutorial in it depends on the suggestions os keep inform me with your suggestions. Thanks. HI looking for ‘How to use Serial Registers in Proteus ISIS.’ Could you post the link. The pdf format of this tutorial is for sale. You can get it for $5, if you want, otherwise you can read it from here. Hi Syed, I would like to buy the complete tutorial on How To Use Proteus ISIS & ARES on pdf. How do I buy and also subscribe to the wesite? AOA, Dear Shah Sb,previously yours good self sent me a LCD code/hex file for which I am highly grateful . Now I am in need of more details about pcb designing like making footprints wider or narrower,measurement of pcbs and others. I also want to know about arrows (path) of signals and alternating current on the diagram when played(ISIS). Regards. Hi, No I don’t think it’s possible in Proteus but you should check out the new post on how to use ldr sensor in Proteus. It’s quite similar to yours so may be it will help. I wanted to know how to control a stepper motor using any controller with a video or a just simulating a stepper motor, hence please help me out. If yes i’m ready to give you my mail. Stepper motor control via arduino is given on our blog, search it out.